Mark Lewis Introduction to the Art of Programming Using Scala was the first textbook to use Scala for introductory CS courses. Fully revised and expanded, the new edition of this popular text has been divided into two books. Introduction to Programming and Problem-Solving Using Scala is designed to be used in first semester college classrooms to teach students beginning programming with Scala. 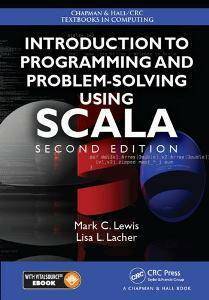 The book focuses on the key topics students need to know in an introductory course, while also highlighting the features that make Scala a great programming language to learn. The book is filled with end-of-chapter projects and exercises, and the authors have also posted a number of different supplements on the book website. Video lectures for each chapter in the book are also available on YouTube. The videos show construction of code from the ground up and this type of "live coding" is invaluable for learning to program, as it allows students into the mind of a more experienced programmer, where they can see the thought processes associated with the development of the code.